The government has released further details of a new rail franchise, which will combine the existing Inter City West Coast services with the development and introduction of services on High Speed 2. The new franchise, West Coast Partnership rail franchise, will deliver services on the West Coast Main Line from 2019 as well as designing and then running the initial high speed services from 2026. The Department for Transport has published a ‘prospectus’, providing information on this exciting proposition for companies interested in this unique opportunity. HS2 will be the backbone of Britain’s railways, creating more seats for passengers on the West Coast, and increasing capacity on the rest of the network. We need world-class expertise to deliver this new chapter in modernising the railways. We are calling for bidder groups with a blend of skills including operating conventional rail services, high speed rail services, technical innovation and great customer service. We expect to attract highly experienced companies, which ultimately means a better deal for passengers both now and in the future. 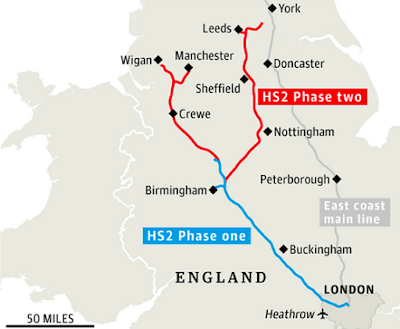 HS2 will generate economic growth throughout the country and reduce crowding on the existing network. Phase 1, due to open in 2026, will see trains travel at high speed between London and Birmingham, and continue on to serve other destinations on the existing West Coast Main Line. The partnership will be central to developing an integrated operating environment for future HS2 services - one that works with the existing network. By bringing all our skills, experience and ideas together, we will create the best railway in the world. The franchise will be expected to deliver excellent services for West Coast passengers while collaborating with the HS2 construction project to develop the best service for passengers. The new operator will need to build on the existing West Coast franchise to deliver a service which puts the needs of passengers first – driving up reliability and punctuality and improving connections to towns and cities along the route. West Coast passengers should see benefits before the introduction of HS2 passenger services, through the early introduction of the new technology being developed for the new railway. The winning bidder will collaborate with HS2 Ltd to design, launch and operate the initial HS2 services and deliver the transition of the timetable on the West Coast Main Line as it is revised to take advantage of the extra capacity provided by HS2. The new operator will also be expected to work closely with local transport authorities, Transport Scotland and the Welsh Government to ensure passengers receive the excellent experience they demand from the West Coast Main Line. The completion of the first phase of HS2 will more than double the number of seats departing from Euston at rush hour from 11,000 to around 23,000. The majority of intercity trains will run on the high speed network, allowing more commuter services to run on the West Coast line. The new franchise is scheduled to start 1 April 2019. The delivery of the West Coast Partnership will require a new short term contract of approximately 12 months for the continued operation of services on the West Coast Mainline, following the end of the current franchise in 2018.